Moscow’s cat owners can now leave their furry friends at a special feline retreat in the city when they head off on vacation. Not only does Sir Cat offer a convenient home from home for pets, it also allows owners to keep an eye on their beloved animals via a webcam service. Sir Cat, a newly-opened cat hotel, could be mistaken for one of dozens of similar feline retreats in Moscow if it were not for a small detail. With the help of an online pet watch service, owners can keep an eye on their furry friends whilst they are thousand miles away. A set of fourteen glass pens adorned with a country-style fence and equipped with web cameras, Sir Cat opened in a Moscow business center a couple of weeks ago. Located within a 20-minute journey from the city center, Sir Cat is currently accommodating six cats whose owners are away on vacation. The guests are under surveillance around the clock so that the owners can log on and peek in on their beloved pets via smartphones. Sir Cat provides modest but comfortable accommodation, with the suites made of tempered glass, the most hygienic material available, according to founder Andrei Pushkin. For 450 rubles ($12.5) per night, a cat will be accommodated in a 1.3-sq. meter and 2.3 meter-long run featuring five shelves for active furry felines, mats, bowls with food, litter boxes and a ventilation system, consisting of a set of pipes attached to each pen. Pushkin said that the idea of a cat hotel first came when he was searching a temporary home for his cat while heading off for his Christmas vacation. “Sometimes it was my sister who kept the pet while I was away, then my friends, but that time nobody could keep it so I had to cancel the trip and stay at home,” he said. Pushkin said that many Russian pet owners are cautious about existing feline retreats. Sir Cat, on the contrary, gives its clients everything that they lack in other catteries, including proximity to the city center, online web cameras installed in each pen, clean spacious cages and affordable rates. The webcam service can be a good source of amusing stories. One of the clients once called Pushkin after watching his cat being picky about the food, and asked for a chicken breast in a pet’s bowl to be replaced with dry food. “They can easily message me and ask me to scratch a cat’s ears if a pet looks sad,” Pushkin said. “I combine the roles of CEO, marketing director and administrator,” said Pushkin, a former corporate finance specialist who had to quit a well-paid job in a state-run corporation to focus purely on his new business. Asked what was behind the decision to shift from stable corporate life to entrepreneurial challenges, Pushkin said that now he felt he was doing something really useful for people, something that makes their life easier. “It took me only three months to launch this project from scratch and I can see how this startup grows day by day as I add new pens, adjust services, and receive feedback from grateful pet owners,” he said. According to the founder, his main goal is to ensure the cattery’s year-round occupancy - this will allow him to break even within 1.5-2 years. While the tourist summer season may be dominated by vacationers bringing their pets to the cattery, low seasons can easily be covered by businessmen traveling for work and looking for decent accommodation for their cats. “Soon after we opened in this business center, all the resident companies here were aware of our cat accommodation service, that’s how word of mouth works,” Pushkin said, showing a small window in the door to the cattery, overlooking the pens. People passing along the corridor in the business center can peep through the window and see the fluffy residents. “Just like hostels or a pet clothes store, a pet hotel is a good idea for a small- and a medium-sized business but it’s not a large-scale project,” Lysenkova said, adding that since the emergence of the first pet retreats in Russia about ten years ago, there has been no significant expansion in the segment. Although Russia has the third largest cat population in the world, it lags behind in the cattery services segment. The United States, the country with the biggest feline population, and Britain, the seventh most cat-populated, have a long history of animal accommodation and pet-friendly hotels. 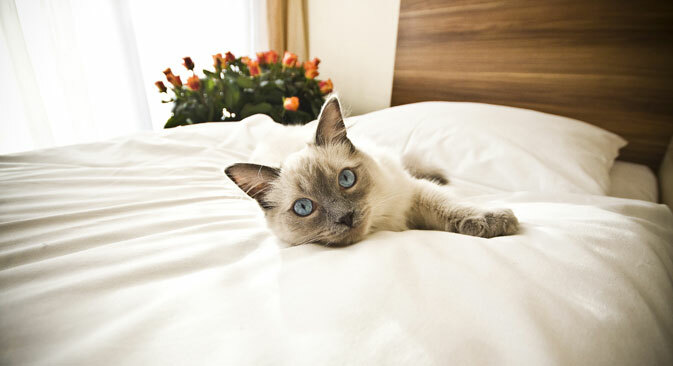 Apart from the numerous catteries offering modest accommodation for pets, British hoteliers are actively developing upscale boutique hotels for their much-loved domestic felines, such as the Ings luxury cat hotel in West Yorkshire, or another British cattery, Balneath Wood boutique cat hotel, in Mid-Sussex. According to Lysenkova, Russian hotels are far from being pet-friendly. “There are some of them which prohibit checking in with animals, some allow pets but charge an additional fee for cleaning,” she said, adding that since Russian tourists do not usually travel with their pets, there is no drive for these services to appear in hotels. “Attention to animals is a sign of a developed society. Russia has yet to achieve this level,” Lysenkova concluded.